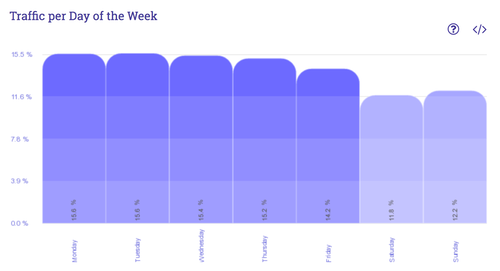 This graph shows the average daily visits(*) on your site over a typical week, in percent. The data is cumulative since the beginning of tracking. * A 'visit' or 'session' is started when a visitor opens your site in a browser. It is terminated when that same visitor (defined by his IP address or a cookie) has been inactive for more than 30 minutes. If the visitor comes back to your site after more than 30 minutes, a new session is counted. The exact percentage for each day can be read at the bottom of each bar or by hovering your mouse over the bar.